From the Assessment Homepage, scroll down to the bottom of the window where a Details/Workflow Widget is available. 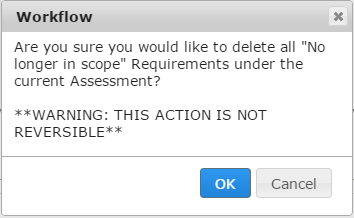 Click the Action Drop-down and choose the Delete “No longer in scope” Requirements option. You will be required to confirm this action via a prompt. !THIS ACTION IS NOT REVERSIBLE. DELETED REQUIREMENTS CANNOT BE RECOVERED.